The Central Peninsula is Taking Shape! 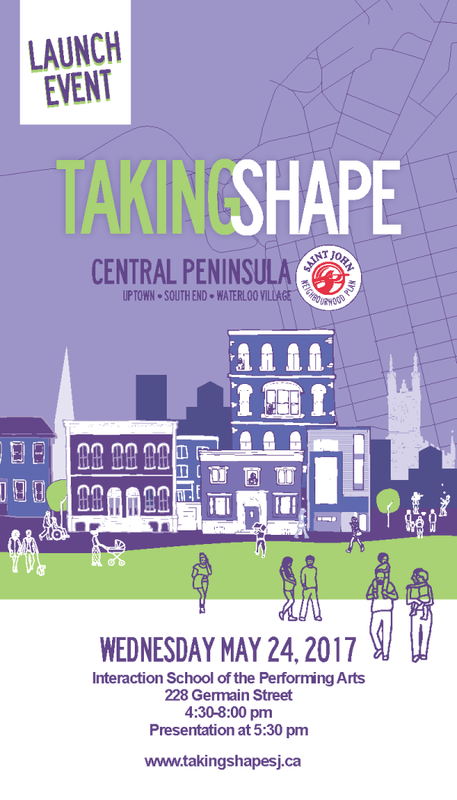 On Wednesday, May 24th the City of Saint John will be hosting the Public Launch of the Central Peninsula Neighbourhood Action Plan at the Interaction School of the Performing Arts, located at 228 Germain Street. This will be the first opportunity for the community to help in shaping the future of the Central Peninsula. At this event, you will be able to learn details about the neighbourhood planning project, upcoming opportunities for public involvement, to meet the Citizen led Neighbourhood Action Team, and to provide feedback on the future growth and change of the Central Peninsula. The event will be family friendly, with daycare provided on site. The public launch will begin with an open house at 4:30PM. Food will be provided and presentations about the Central Peninsula Neighbourhood Action Plan will begin at 5:30PM.